Loja is the capital of the Loja province in southern Ecuador, accessible via the Pan-American Highway, or by air at the nearby Catamayo airport. It is one of the oldest cities in Ecuador, founded by Field Marshal Alonso de Mercadillo in 1548, who named the city after his hometown back in Spain. At the time of its founding, Loja’s importance was based mostly on gold mining. The region of Zaruma, just to the east of Loja, was the site of rich gold veins, and the Spaniards wanted a fortified town in the area to protect it. Loja also became well known as the starting point for expeditions into the Amazon Basin, looking for the fabled “City of Gold,” El Dorado. Loja sits near the bottom of the glacially formed Cuxibamba valley, although in this part of the Andes, “bottom” is a relative term. Still, the altitude is a little lower than Cuenca, at about 6,500 feet, giving it a similar but slightly warmer climate. Temperatures tend to range between 60 F and 85 F (even at night, it rarely gets below 60 F) throughout the year, with the wettest months being December through March. This is a city of art and culture. There is a local saying, “The one who does not play the guitar can sing a song; the one who does not sing a song can write a verse; the one who does not write a verse can read a book.” Popularly known as “The City of Music,” Lojanos prefer “The Music and Cultural Capital of Ecuador” since they also have a strong tradition of art and literature. Loja is home to at least three major universities, including a new technical college. There are many museums as well, the most popular being the Museo de la Musica. It is also a city of parks and squares, with several famous churches to explore, and a lot of greenery to enjoy, especially along the two rivers of the city, the Rio Zamora and Rio Malacatos. Many of the streets are tree lined, or have a lushly verdant median strip. With a population approaching a quarter of a million, Loja has much of the infrastructure of a city, but is still small enough to maintain that “small town feel” and sense of community that many find to be so important. Loja is an attractive retirement spot for those who don’t require a strong expat presence, have some Spanish language skills, and who are looking to live in a mountain town that is not too large, but still provides for an easy lifestyle. There are expats living in Loja, but it is a small community, less than two dozen, and they are scattered around town—there is no “gringolandia”. This is a safe city, and the temperate climate makes it a walkable one too. The local bus system and low-cost cabs make Loja an easy place to live without the expense of a car. Surrounded by farms and ranches, Loja also boasts several mercados where fresh produce and meats can be found at low prices. Of course, you are not limited to markets—Loja has chain grocery stores like SuperMaxi and Mi Comiseriata, shopping malls, major appliance stores, hardware stores, and everything else a modern consumer might need. The universities and music schools in Loja also add some unique perks for the retiree. Many of the students need to learn English, so there are opportunities for employment. There are schools for doctors and dentists, which means there are teaching clinics where you can find quality healthcare at a discount. And the many schools for the arts provide free concerts, dances, and art galleries. Speaking of healthcare, in addition to the usual clinics and labs you find in most cities, Loja has several hospitals to choose from. There is a large IESS (government sponsored healthcare) hospital, and a new private hospital connected with UTPL (the largest university in Loja) that provide excellent service. There are many things to see and do in Loja, and plenty to keep you busy no matter what your lifestyle. As you would expect in “The Music and Cultural Capital of Ecuador,” there are a plethora of museums and venues for dance and musical performances. You can dress up and enjoy a performance at the new and elegant Teatro Nacional Benjamin Carrion Mora, but there are also artists performing daily on one or more of the many beautiful squares in town. Perhaps the most iconic structure in Loja, the City Gates, also houses works of art on a rotating basis. With the restaurant now open for lunch and dinner, you can take in the art and dine with terrific views of the city. Restaurants of many cuisines abound in Loja. The fact that this is a college town means there are plenty of reasonably priced places specializing in typical “student cuisine”—pizzas, hamburgers, Mexican, Chinese, and Indian foods are all represented. Ecuadorian cuisine and tastes of other Latin American countries are also waiting for you to discover. As a culinary bonus, because Lojanos also embrace the indigenous cultural heritage, you will find Kichwa restaurants like Kusi Runa, where traditional foods are served. The adventurous can even try pincho de cuy (grilled guinea pig on a stick with vegetables) with wonderful fresh-fruit sangria. For those interested in the great outdoors, Loja has many places to stretch your legs and enjoy both architecture and nature. Downtown, there is of course the central square with the main Cathedral that hosts the statue of the Virgin de Cisne for part of the year, as well as squares like San Francisco, San Sebastian, Santo Domingo, and more to satisfy the urban explorer. There are tree-lined walkways along the rivers, and several parks, the most popular of which are the long and narrow Parque Lineal, the large Parque de Colinas del Pucara, and the unique Parque Jipiro. For a more untamed environment, at the southern end of town is one of the entrances to the 565-square-mile Parque Nacional Podocarpus. 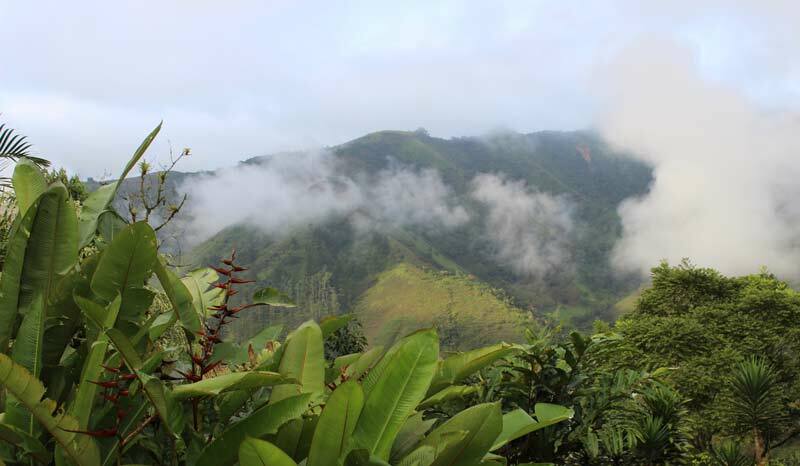 This nature preserve is classified as a “megadiverse” environment, as it includes four distinct ecological systems: the Northern Andes, Southern Andes, Amazon, and Pacific. It is home to 68 species of mammals and 560 species of birds—in fact, it is estimated that 6% of the birds of the world and 40% of the birds of Ecuador are represented in this park. It is also called “The Botanical Garden of America” because more than 4,000 types of plants grow there. Popular day trips from Loja include a visit to Zamora to the east, or Vilcabamba about an hour bus ride south of the city. Loja is not only attractive to the eyes and soul, living here is also easy on the wallet. It is an affordable city to live in. Loja packs a lot into a small area. City buses cover the main thoroughfares and cost just 30 cents per trip, 15 cents for those over 65. Since the city is not that big, cab rides are usually between $2 and $3. This allows expats to live comfortably without the expense of owning a car. The downtown area of Loja has two- and three-bedroom apartments to rent in the $250 to $350 a month range. Even furnished modern apartments can be found between $500 to $700 a month. In the more “upscale” homes in the hills just above the town, rents are still very affordable, for example a four-bedroom home was recently available at $500 per month. Condo prices start as low as $95,000 for new construction, with single-family homes also starting well below $100,000. Loja has several malls, and two large chain supermarkets. Prices in these are consistent with the rest of Ecuador (imported items are expensive, while local products are more affordable), but bargains are to be found at the three large mercados in town. There you can buy fresh fruits and vegetables cheaply, as well as meats, fish, and other staples. Expats report that they eat well when shopping locally on about $400 a month for a couple. Typically, lunch for two at a restaurant will run less than $10 and dinners less than $20 (without alcoholic beverages). A lower cost, popular lunch option is the almuerzo, which is a fixed-menu lunch option that generally includes a soup, small salad, rice, meat or fish, another side item, and juice. Prices for the almuerzo are between $2.50 and $3.50 per person. Loja has a large IESS hospital and several IESS clinics, so expats can enroll in the IESS medical coverage plan, which costs about $80 a month for a couple. This gives you access to free healthcare at the IESS facilities. Private clinics and hospitals are also available, with general appointment costs between $20 and $40. Like most of Ecuador, private hospital care is one half to one third the cost of comparable services in the U.S.
Until a few days ago my knowledge of coffee was as follows: buy a bag at the store once in a while and drink a couple of cups to get me going each day. I’ve just returned from an extremely interesting tour, organized by the owner of a local coffee shop here in Cuenca, Ecuador, with a new-found appreciation for my morning beverage. Ecuadorian coffee is of excellent quality and often organic, but you won’t find it at your grocer or Starbuck’s. Production is nowhere near the level of, say, Colombia or Costa Rica. After observing the hard work of artisanal growers and processors I’ll never complain about the price of coffee again! I also came home quite impressed with Loja, the city where we overnighted during our trip. 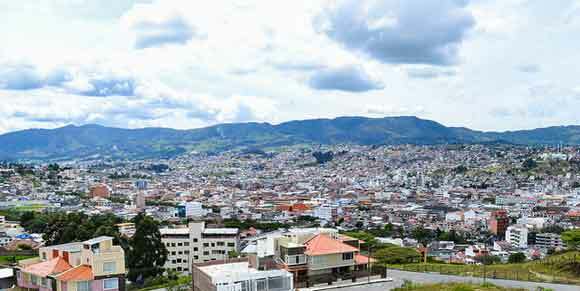 It’s the capital of the Loja province, has a population of around 200,000, and sits at about 6,800 feet. That’s 1,400 feet lower than Cuenca, so it enjoys a warmer climate year round. Loja hasn’t gotten a lot of attention as an expat destination, mainly because of a perception that hardly anyone there speaks English. But actually—I was in the liquor store next to our hotel after the first day of travel. I asked, in Spanish, the cost of a bottle of wine. “Twelve dollars,” the proprietor replied, in English. I inquired about good restaurants nearby. “What would you like to eat?” the customer behind me said—in English. Somewhat flummoxed, I stopped by the front desk of the hotel and requested, in Spanish, a map of the city. “Where do you want to go?” asked the clerk—yes, English again. Loja has most things that you will find in Ecuador’s retiree favorite Cuenca, with a warmer climate. Now maybe by some fluke I stumbled upon the only three English speakers in town, but I kind of doubt it. I’m not suggesting that one should consider expatriating to Loja without reasonable Spanish skills, but the claim that next to no English is spoken there is a myth. So why would you think about moving to Loja? I came away thinking of the city as “Cuenca Lite.” You can find most everything Cuenca offers—just less of it. Loja has a lovely downtown historic area—a gorgeous park—a mall with multiplex cinemas—even a Supermaxi (Ecuador’s largest grocery chain). You’ll find lots of restaurants, gyms, and auto dealerships. Both SOLCA, the country’s premier cancer treatment center, and IESS (Ecuador’s Social Security system) have hospitals in Loja, and there are numerous private medical facilities as well. Housing runs the gamut from brand new mid-rise buildings to single family homes rising up the hillsides surrounding the city. A modern airport less than an hour away has flights each day to both Quito and Guayaquil. And, yes, there’s the climate. Many expats love everything about Cuenca except they find the weather too chilly for their tastes. (Cuenca enjoys average highs of 70 F to lows of 50 F.) Loja offers a similar, although scaled down, city environment plus warmer temps. If you’re considering relocation to Ecuador and the attributes I’ve described resonate, I encourage you to take a close look at Loja. It just might be your cup of coffee! 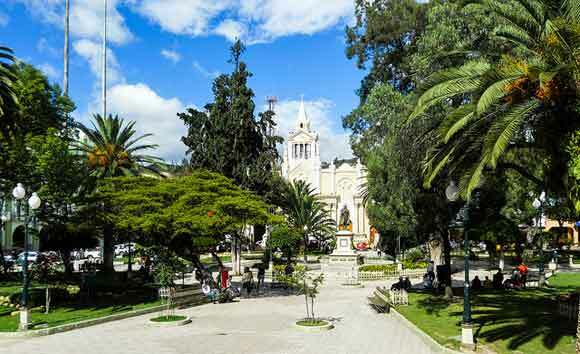 The city of Loja (also known as “The Music and Cultural Capital of Ecuador”), in the southern Andes of Ecuador has long been overlooked as an overseas retirement destination. Slowly that is changing, as more people are discovering this interesting and friendly town. Currently hosting a small expat community, Loja continues to attract notice with its great climate, beautiful scenery, and rich cultural heritage. 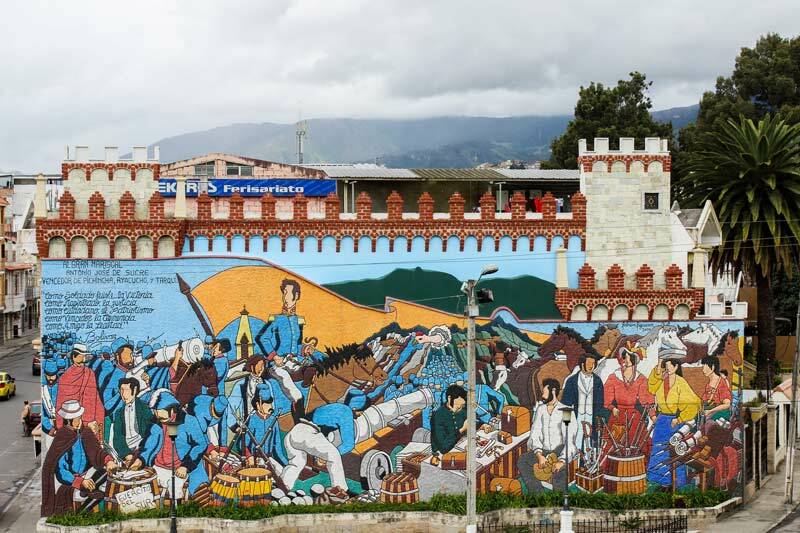 With a population approaching a quarter of million, three large universities, technical schools, museums, parks, and more, there are no shortage of things to see and do in Loja. But let’s take a look at some activities beyond the free concerts and art museums. Here’s a list of five suggestions to get you started. 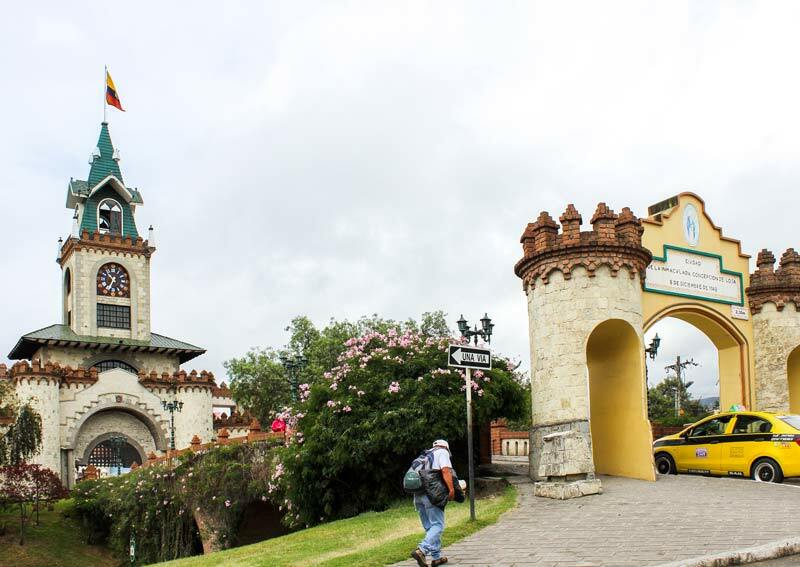 Any visit to Loja must start at the famous City Gates. 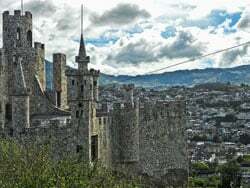 This beautiful structure, built like a medieval castle, is found where the rivers meet and spans one of the main routes into town. Inside, you will find art displays that are changed and updated frequently. You can also walk up to the different levels and enjoy views of the valley. Recently added to the Gates is a restaurant on the third level where you can enjoy local cuisine and admire Loja, stretched out along the Cuxibamba Valley. After lunch, step out to the front of the Gates and look for the orange stripe painted on the sidewalk. It points the way to a self-guided walking tour of eight important sites in Loja. The route is just over two miles, and will guide you to places like the Museo de la Musica, Parque Central, and Plaza San Francisco. You will learn much about the town, and will spot several restaurants to add to your “must try” list as you walk the portion on the street of 24 de Mayo. 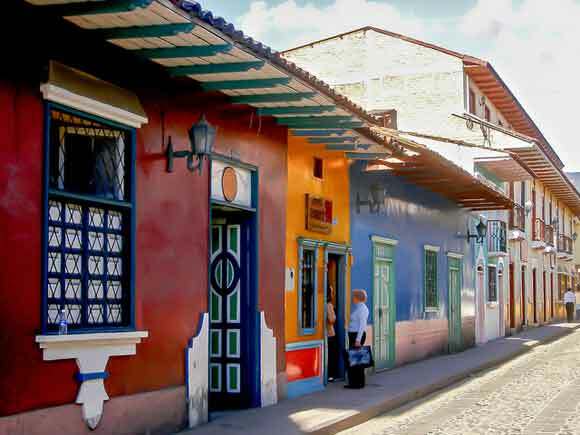 You will also enjoy the colonial architecture and colorful buildings on Lourdes Street, one of the oldest streets in the city. 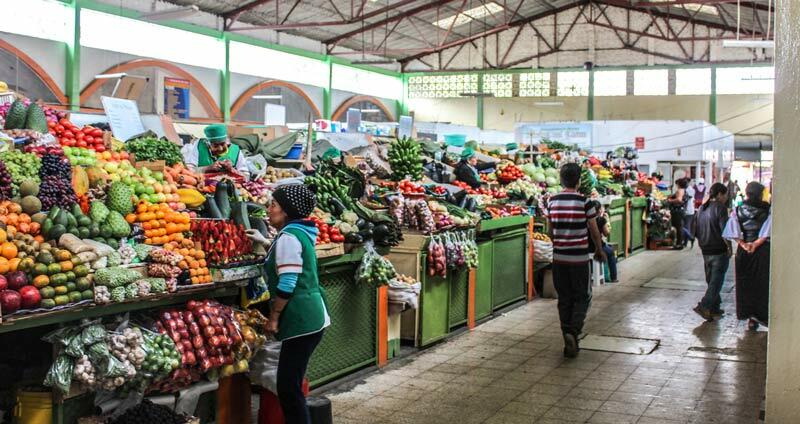 Loja has three major mercados, the largest being the Mercado Central, where your walking tour finishes up. This two-story structure is the oldest market in Loja, and was completely renovated in the 1980s. The first floor displays mostly fruits, vegetables, and flowers, in an almost overwhelming abundance. The second floor has many eateries, along with clothing, household items, chocolate, and hair and nail salons—really almost anything you can think of, you will find at the Mercado Central. Prepare to be pleasantly shocked by the low prices for fresh produce of superior quality. On the south side of town you can take a tour of the world without ever leaving the 25 acres of Parque Jipiro. 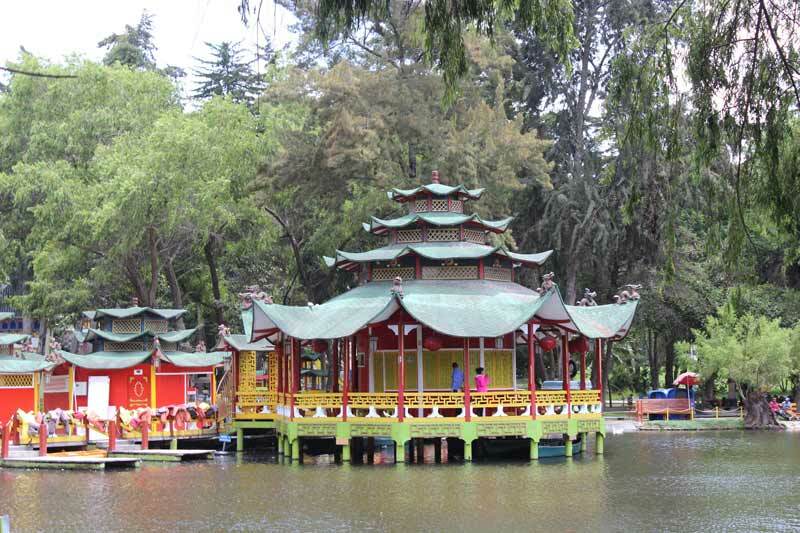 Dedicated to cultural diversity, this park features areas dedicated to more than eight different countries and peoples. There’s also a small zoo, a paddle boat course, skateboard park, pony rides, and of course several places for snacks and beverages. This is a great place to walk for exercise, play a game of chess on the lawn-sized chessboard, or just sit and relax on one of the many benches. If you run out of things to enjoy in the park, stop by the north entrance and take a swim in the large public pool. With a plastic retractable roof, the Piscina Municipal is available regardless of the weather. Just outside of town you will find an entrance to one of the largest public parklands in South America. The Parque Nacional Podocarpus covers 565 square miles, and includes four different ecological systems: The Northern Andes, Southern Andes, Amazon, and Pacific. Hiking trails are available for short explorations as well as all-day adventures. Podocarpus is home to 560 types of birds and 68 varieties of mammals, including some that are on the endangered species list. If you are the outdoor type and have some time to spend there, you can visit the Lagunas del Compadre, where you can camp and fish the series of small lagoons. The park is a great place for nature photography, hiking, and mountain biking. There are also places where you can rent horses to explore from the saddle. The park is open 365 days a year, and there is no charge to visit. So what are you waiting for? Vibrant and charming Loja is waiting for you to come see what makes this off-the-radar place so special.